I’ll share how you can get Big Travel with Small Money on a trip to the Big Apple, including tips from Million Mile Secrets readers! Using Miles & Points Can Save You Lots of Money on a Trip to New York City! And There Are Many Free Things to Do Once There for Folks Traveling on a Budget! Using miles & points can save you money on flights and hotel stays. 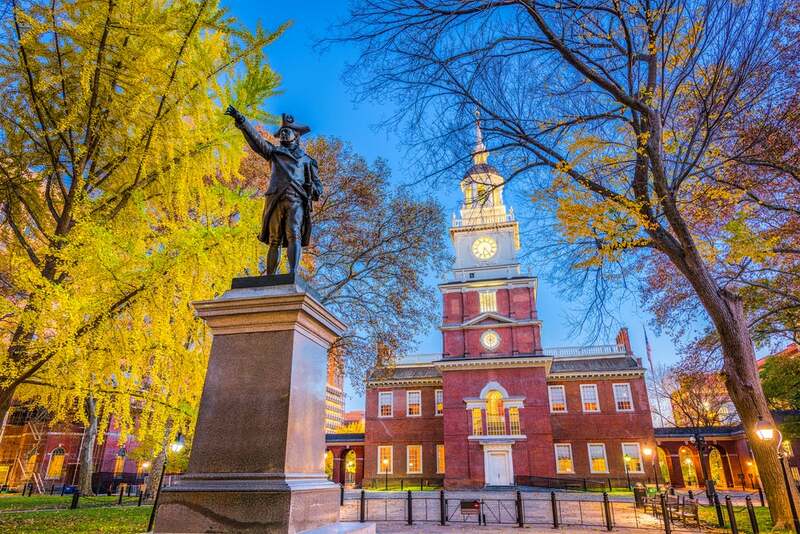 And there are plenty of cheap or free things to do throughout the city, like exploring beautiful parks or attending the taping of popular TV shows! It’s easy to fly into New York from just about anywhere. The city has 3 major airports: JFK, LaGuardia (LGA), and Newark (EWR). And there are hundreds of flights per day. The best flight deals can vary depending on your travel dates. But I suggest checking flights to all of the major airports to see if you can save money. Don’t forget to do the math on transportation costs to and from the airport. Because where you’re staying in New York will determine if it’s less stressful to take a taxi or use public transportation. Here are ideas for folks looking to get New York cheaply! 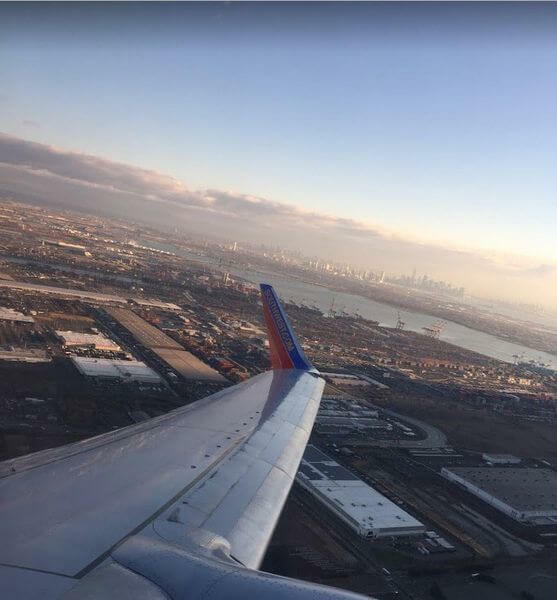 Southwest flies into New York’s LaGuardia Airport (LGA), Newark Airport (EWR), and Long Island Airport (ISP). You can find great deals on the airline, especially when there’s a fare sale. But flying Southwest is an even better option for folks with the Companion Pass. Because a friend or loved one can join you for nearly free on paid and award tickets! Don’t forget, now is a terrific time to earn the Companion Pass because all 3 Southwest cards are offering the highest sign-up bonuses I’ve seen! You Can Book Cheap Southwest Fares to New York City! And Folks With the Companion Pass Will Get an Even Better Deal! Change Without Fees – If your plans change, you can make adjustments to your flight for free. However, if your new flight costs more, you’ll have to pay the difference. Get 2 Free Checked Bags – Every passenger gets 2 free checked bags. This saves you ~$25 per bag. Be sure to check out the post Lyn from GotoTravelGal.com wrote about planning a family trip to New York City using Southwest points. You can use United Airlines miles to fly into Newark or LaGuardia airports. A round-trip saver coach award ticket costs 25,000 United Airlines miles from anywhere in the US and Canada, except Hawaii and Alaska. Keep in mind, if your flight is less than 700 miles, you’ll only pay 10,000 United Airlines miles for a one-way award flight. There are lots of ways to earn United Airlines miles, like transferring flexible Chase Ultimate Rewards points directly to United Airlines at a 1:1 ratio. 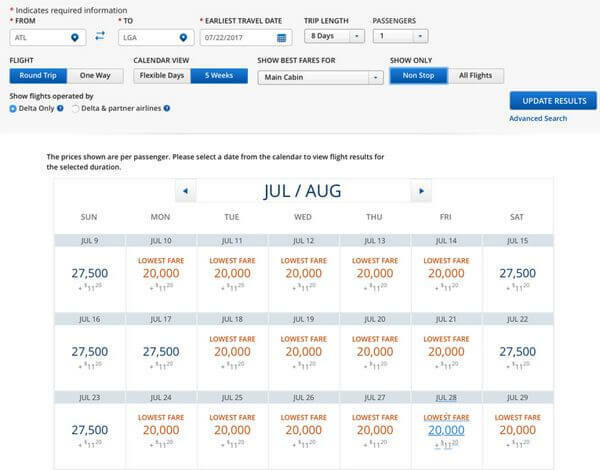 And check out my guides on how to navigate the United Airlines award calendar and use the United Airlines award chart. If you’re a short flight away from New York City, you can do well with British Airways Avios points. Because British Airways has a distance-based award chart. This means the amount you’ll pay depends on the length of your flight. And you can use British Airways Avios points to fly to New York City on partners like American Airlines. 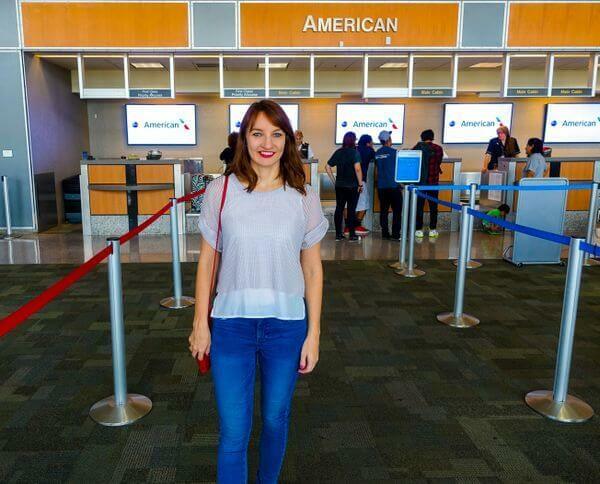 You Can Use British Airways Avios Points to Book an Award Flight on American Airlines! A one-way coach award flight less than 650 miles costs 7,500 British Airways Avios points. This is a great deal if you’re traveling from cities like Boston, Cleveland, Detroit, or Philadelphia. You can check the Wandering Aramean tool to calculate how many miles your departure city is from New York City. And British Airways Avios points are easy to earn! For example, you can earn points directly with the Chase British Airways card. Or transfer points from flexible points programs, like AMEX Membership Rewards, Chase Ultimate Rewards, or Starwood Preferred Guest. Don’t forget, you can also book cheap American Airlines award flights directly. Award flights less than 500 miles cost 7,500 American Airlines miles one-way in coach. JetBlue has a state-of-the-art terminal at New York (JFK) airport. But they also have flights into Newark airport. Folks love JetBlue because there are never blackout dates for award seats. And they have extra legroom in coach, free in-flight Wi-Fi, and awesome snacks. Plus, flights from certain cities have comfortable JetBlue Mint Business Class seats. Team member Keith and his wife try to book these seats when flying from Los Angeles to New York. And JetBlue points are easy to earn directly with any of Barclaycard JetBlue cards. JetBlue is an American Express Membership Rewards transfer partner. The transfer ratio is 5:4, but sometimes there are transfer bonuses. You can also transfer Citi ThankYou points directly to JetBlue. But keep in mind, the transfer ratio depends on which Citi card you have. Delta no longer publishes an award chart. This means you’ll have to search a route to see how many miles it costs for an award flight. But it’s possible to still find good deals. For example, I found a round-trip award flight from Atlanta to New York (LGA) in July 2017 for 20,000 Delta miles. And keep in mind, Delta has non-stop flights to all 3 of major airports in the New York City area. Don’t forget, you can also use Delta Pay With Miles to avoid blackout dates. This way you can redeem Delta miles at a rate of 1 cent per mile to pay for (or discount) the cost of Delta flights. So 50,000 Delta miles are worth $500 (50,000 miles X 1 cent per mile). This benefit is only available to primary cardholders of American Express Delta SkyMiles cards. And now is a good time to earn Delta miles with the limited time offers on the AMEX Delta cards! You can find fare deals to New York City on airlines such as Frontier Airlines, JetBlue, or Spirit Airlines. For example, folks booking last-minute can find incredibly cheap fares by booking a JetBlue flash sale when they pop up. Here’s a post about how to find and book low fares. New York City hotels tend to be expensive when you pay cash. To save money, you can use hotel points or free night certificates! 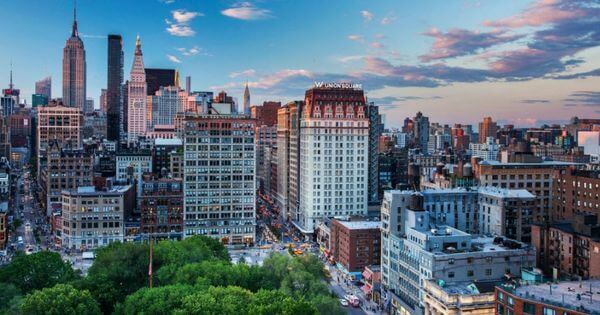 And Million Mile Secrets reader UAPhil shared fantastic advice for folks looking to save money on a paid stay in New York. 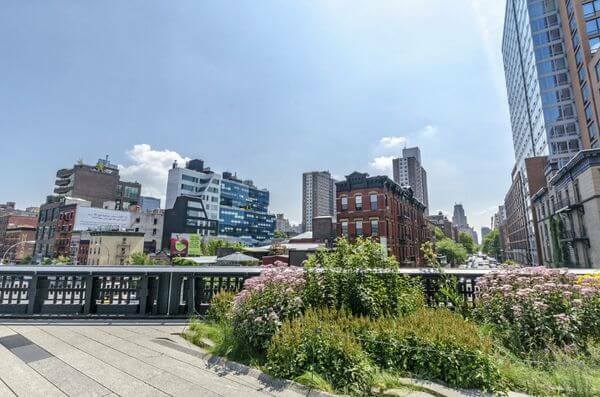 Consider expanding your search to Long Island City, which is in Queens, but provides easy access to Manhattan thanks to the nearby subway station at Queens Plaza. Or you can consider other areas outside of New York City, like Hoboken or Jersey City in New Jersey, which have great transportation options for getting to Manhattan. I recommend using sites like AwardMapper and Hotel Hustle to save time searching the cost of award nights at hotels. These tools can also help you narrow your search to certain chains or locations throughout the city! The Chase Hyatt card is a great pick for folks looking to splurge on a stay in New York City at a hotel like the Park Hyatt New York, which can cost $1,000+ per night. Because with the card, you’ll earn 2 free nights at ANY Hyatt hotel after spending $2,000 on purchases in the first 3 months of account opening. You can also use less cash on a hotel stay with Hyatt by booking with points & cash. And don’t forget, you can transfer Chase Ultimate Rewards points directly to Hyatt. You’ll have 150+ hotels to choose from in the Big Apple when using Marriott or Starwood points now that the chains allow you to transfer points between loyalty accounts. With this many options, you’re more likely to find award nights available in nearly every major Manhattan neighborhood and destination, like Midtown, Times Square, Central Park, and the East Village. And hotel points are easy to earn directly with hotel cards like the AMEX Starwood and Chase Marriott. And folks who qualify for a small business card can consider the small business versions of the AMEX Starwood and Chase Marriott cards. You can read my post with the top 5 hotels in New York City to book using Marriott & Starwood points. 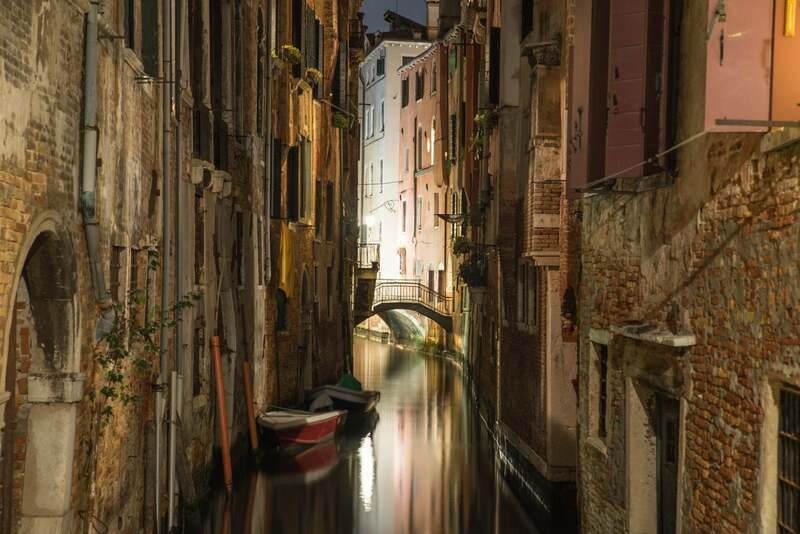 Link: Save Big Money on Paid Hotel Stays With the Citi Prestige 4th Night Free Perk! Folks planning to book a paid hotel stay in New York can do well with the Citi Prestige 4th night free perk. Because Citi Prestige cardholders can get a statement credit for cost of the 4th night at major hotel chains, boutique hotels, and even hostels when they book through the Citi Concierge. 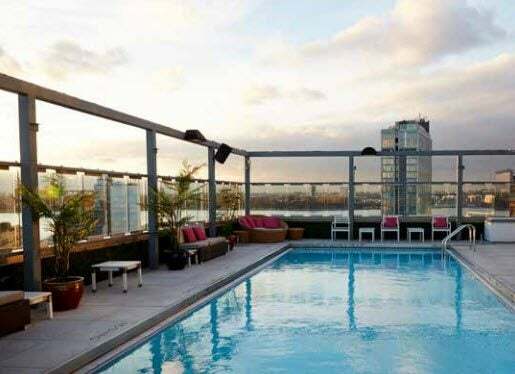 So whether you book an inexpensive stay at a hotel like The Salisbury, or a luxurious stay at the Gansevoort, the savings from this perk can add up! Note: Beginning July 23, 2017, the 4th night free perk will refund the average cost of a 4-night stay, NOT including taxes. Book a 4-Night Stay at the Luxurious Gansevoort Hotel in New York City Through the Citi Concierge Using Your Citi Prestige and Get a Statement Credit for the 4th Night! Team member Keith frequently takes advantage of the 4th night free perk and thinks it’s one of the best credit card benefits! 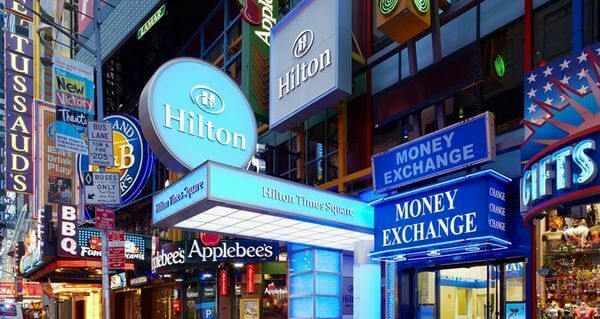 For example, you can use Hilton points to stay at the Hilton Times Square. This hotel is walking distance to Broadway theaters, Madame Tussauds Wax Museum, Macy’s Herald Square, Madison Square Garden, Radio City Music Hall, and Restaurant Row. Or use points or the anniversary night certificate from the Chase IHG card for an award stay in New York City. 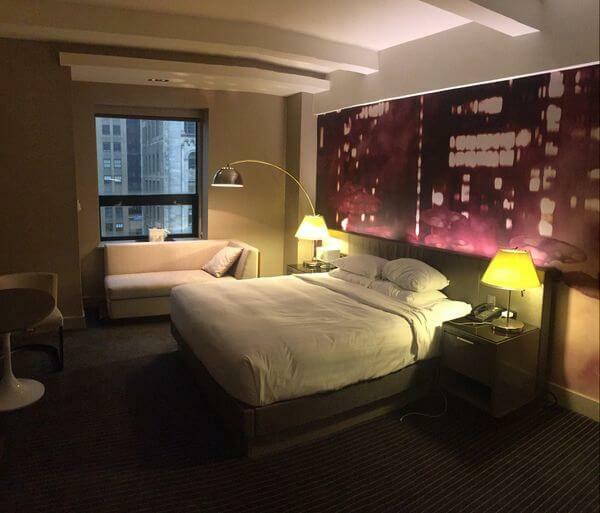 Million Mile Secrets team member Scott recently used IHG points for his parents’ stay at the InterContinental New York Times Square. His parents loved the city views from their room, and the location because it was a short walk to the Broadway show they attended! Booking a stay on Airbnb can be a great way to save money and experience a neighborhood that might not have hotels. For example, when I stayed on the Upper East Side of Manhattan with my mom and sister. Just remember pricing is up to individual hosts, so you might have an opportunity to get a better price! Here are some fun summer activities where you can explore New York City with Small Money. The Bronx Zoo is a great idea for a family activity! And every Wednesday you can see all the wildlife for free! The New York Botanical Garden is close to the zoo and it’s also free on Wednesdays. And you won’t pay Saturday mornings from 9:00 am to 10:00 am. 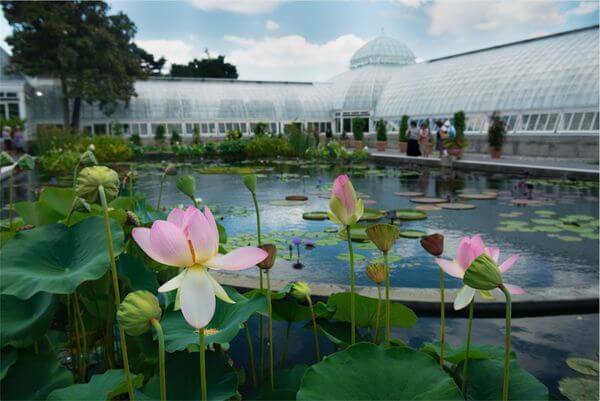 Amongst the Hustle & Bustle of New York City Is the Beautiful Botanical Garden in the Bronx! And if you’re looking for an ultimate New York experience while you’re in the area, you might consider buying cheap tickets to a Yankees game. The stadium is only a ~15 minute drive from the Bronx Zoo! I know folks who like to see popular TV shows when they’re visiting New York City. I’ve written how you can get free tickets to popular shows like The View, The Today Show, and The Tonight Show Starring Jimmy Fallon. Be sure to plan ahead if you know when you’ll be visiting to increase your chances of getting tickets. Many of New York City’s world-famous museums offer a day with free entry. The Museum of Modern Art (MoMA) is free to visit on Friday evenings from 4:00 pm to 8:00 pm. The Whitney Museum of Art offers a Pay-What-You Wish night on Fridays from 7:00 pm to 10:00 pm. The Metropolitan Museum of Art is always pay what you wish, but it’s recommended that you pay the suggested donation ($25 for adults). Tickets include access to The Met Fifth Avenue, The Met Breuer, and The Met Cloisters. Similarly, there’s a $22 suggested donation to visit the American Museum of Natural History. But team member Keith says it’s worth it because of the fascinating fossil exhibits! 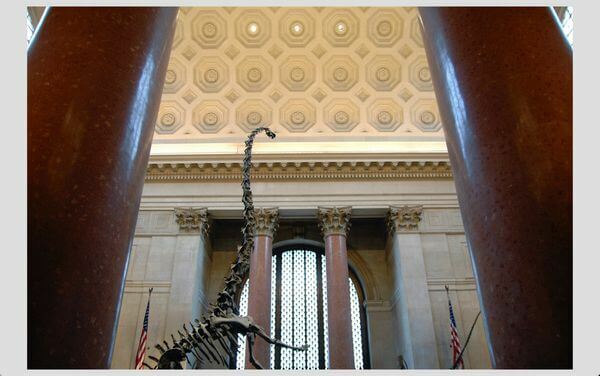 Explore the Amazing Fossil Exhibits at the New York Museum of Natural History! Or visit The Guggenheim, which is a popular art museum that has pay what you wish hours on Saturday from 5:45 pm to 7:45 pm. And if you’re a Bank of America cardholder, I suggest taking advantage of the Museums On Us. On the first full weekend of each month, all you have to do is show your Bank of America debit or credit card at participating museums to get in free. In New York City, you can get into the Queens Museum of Art and the Children’s Museum of Manhattan, and more! Don’t forget to check out my post how to use your local memberships to get free or discounted admission. I have lots of friends who love the High Line. It’s a huge public park in the air built on an elevated section of train tracks that are no longer used. It’s free to enter and stretches nearly 30 blocks! Million Mile Secrets team member Scott enjoys the fresh(er) air, art installations, views of the skyline, flowers, and the beer garden underneath it! There are other activities like music and storytelling, too! While the drinks aren’t free, you typically can take ride the elevator up to some of New York City’s popular rooftop bars for no cost. For example, one of the most popular tourist destinations to experience the nightlife in Midtown Manhattan is at the 230 Fifth Rooftop Bar. You’ll catch a glimpse of the most amazing views of the Empire State Building! 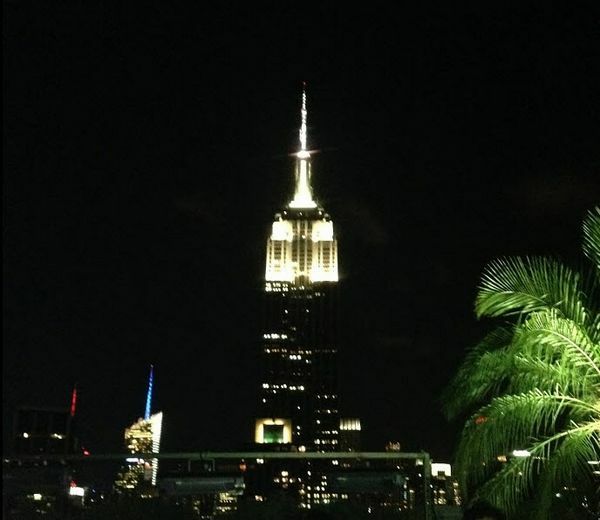 The Views From the 230 Fifth Rooftop Bar Are Certain to Put You in an Empire State of Mind! If y’all are looking to shop in New York without paying big bucks, you might want to find sample sales! These are free to attend and occur regularly throughout the city. Depending on the sale, you can find designer apparel that’s up to 75% off! The Staten Island Ferry is a free fantastic daytime adventure for folks looking to check out the views from the New York Harbor. The ferry ride is ~25 minutes each way! 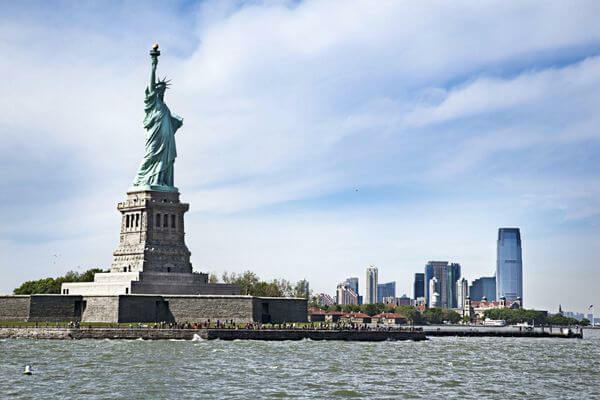 The Staten Island Ferry Offers the Opportunity to Take Photographs of The Statue of Liberty and Ellis Island! The main branch of the New York Public Library is not your average library. It is one of the largest in the US and has incredible architecture! It’s been in scenes of popular movies, including Spider-Man 3 and 13 Going on 30. Emily loved the views of the New York Public Library when we stayed nearby at the Andaz 5th Avenue. The New York Public Library Is More Than 100 Years Old and Is a Historic Landmark! 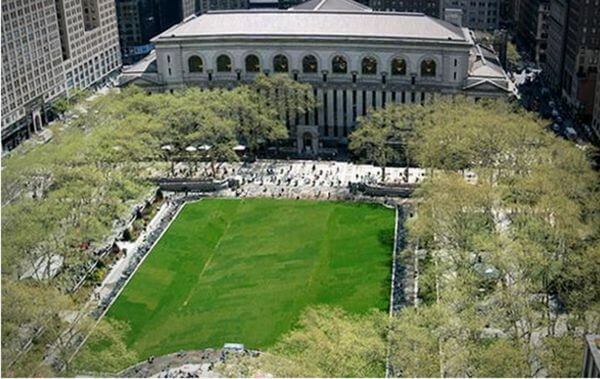 If there’s good weather while you’re at the library, you have to visit Bryant Park, which is right next door! I’ll tell you more about the park below! 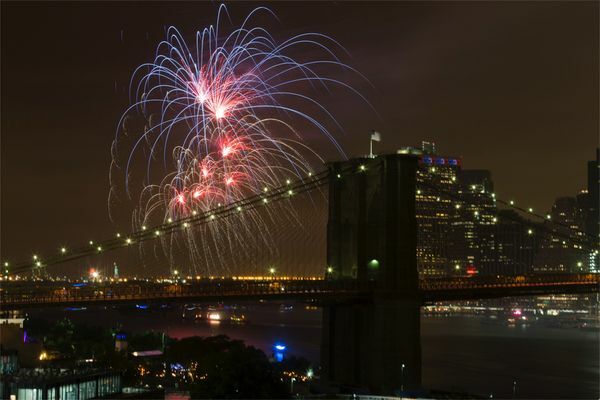 If you’re planning to be in New York on Independence Day, check out the Macy’s fireworks display, which launches from the East River this year. Some folks like to watch the fireworks from the South Street Seaport. But there are lots of locations throughout Brooklyn, Manhattan, and Queens. Million Mile Secrets team member Scott says the views from the Brooklyn Promenade are spectacular! It gets very crowded though, so get there early. Between some of New York City’s largest skyscrapers are some phenomenal open spaces! For example, you can take a romantic stroll through Central Park, which spans over ~40 city blocks and is where locals go to escape the city and enjoy a picnic, play sports, and sun tan. You can also enjoy free Shakespeare performances. And if you’re willing to pay, you can also rent rowboats at The Central Park Boathouse or visit the Central Park Zoo. Or check out Bryant Park. During the summer, you can relax, enjoy free Wi-Fi, and lay out on the lawn. You can also go to a free outdoor movie on Mondays at 5:00 pm. At the Downtown Boathouse, you can take a kayak out on the Hudson River for free. Million Mile Secrets team member Scott has enjoyed this multiple times, taking in inspiring views of the city while rowing with a friend. If you happen to be in the vicinity of Rockefeller Center, you can walk a block over to St. Patrick’s Cathedral. 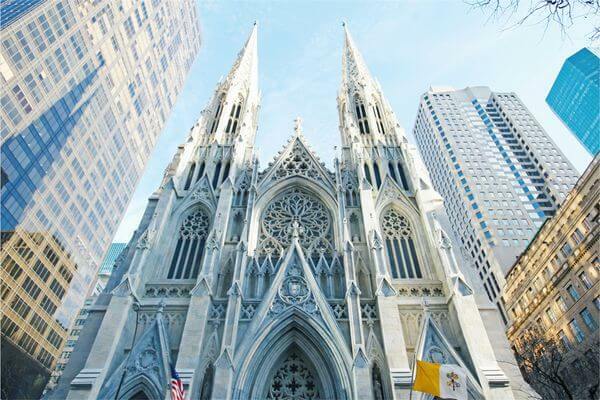 Construction on this magnificent New York landmark started in the 1850s. And it’s large enough to accommodate 3,000 people! You can make a dream summer trip to New York a reality with the help of miles & points! Consider booking award flights with American Airlines, Delta, JetBlue, Southwest, or United Airlines. Or you can find good deals with fare sales on budget airlines! For hotel stays, I recommend using points at Hyatt, Marriott and Starwood hotels. Or take advantage of the Citi Prestige 4th night free perk. Once you’re in the Big Apple, there are plenty of things to do that won’t cost you a dime! 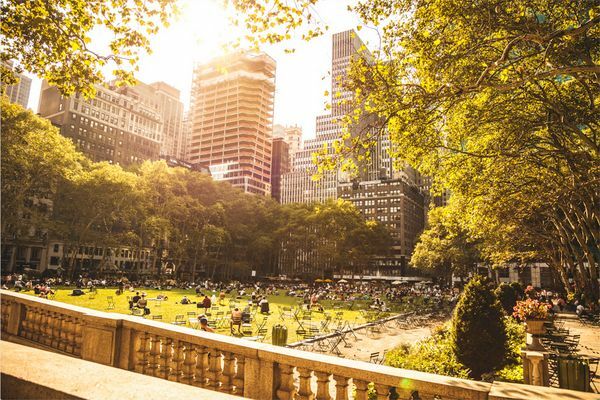 Like exploring magnificent open spaces, such as Central Park and Bryant Park. Or joining the audience of a popular TV show! I’d love to hear your tips for saving money on a trip to New York City! Feel free to share in the comments below! A walk across the Brooklyn bridge is fun. If you start in Manhattan, it takes you close to downtown Brooklyn. Close by is Brooklyn Heights. There is a promenade with a great view of Manhattan. That sounds like fun! Thanks for the tip! We brought our 4 kids to NYC during Spring Break. We watched 11 Broadway shows (including Hamilton and Dear Evan Hansen). We avoided buying absurd ticket prices, we did not buy from scalpers, we did not use TKTS. I’d like to share that with you. I wrote a whole blog entry about it. Our 6 nights in NYC were also all free – Park Hyatt NY and Westin Element Times Square. Wow! That’s definitely Big Travel with Small Money! I appreciate you sharing. Thanks, this will be helpful for a upcoming NY trip. City Pass is another good option for saving on tickets. Where did you see that the Botanical Gardens is free on Wednesday? They currently have a very, very popular exhibit, Chihuly in the Garden, by renowned glass artist Dale Chihuly, which runs through October 29 and I do not believe that any days are free. If you check the buy tickets calendar for Wednesdays, they have a dollar amount. Even the Bank of America free Museums on Us weekends are limited to certain months, which are not specified on the garden website. I doubt they will have free weekends while this exhibit is on because it is drawing great crowds. The exhibit is wonderful and the gardens are terrific. We were just there last week when the Rose Garden was also at the height of its bloom (first week of June). The garden also has retrictions posted on its website under Don’ts: no smoking including e-cigs, and don’t bring tripods, easels, drones or selfie sticks (we did not see anyone using one during the 5 hours we were there). Also, my next door neighbor works at the Bronx Zoo, and he has told us to NEVER visit on a free Wednesday, because it really is a zoo! We went last early November on a Thursday, and while Congo was closed for maintenance and the monorail doesn’t run at that time of year, we had the rest of the zoo almost to ourselves. Most of the time we walked around we saw no one, or 2 or 3 other people. Even at the cafeteria, there were at most 35 or 40 people. Best day we ever had in the zoo. BTW, late spring there are school groups in both the gardens and the zoo – since it’s almost the end of the school year here. And, for anyone who has been to NYC multiple times and is looking for something else – visit the Hudson Valley (accessible by Metro North train in many towns) – we have tons of history, wonderful historic sites, great parks and lots of greenery. Thank you so much for sharing these terrific tips! The New York Botanical Garden website: https://www.nybg.org/visit/admission/ says folks can get free grounds admission on certain days. But as you mention, you’ll have to pay extra to see certain exhibits. There is still plenty to see in the free areas, if you’re on a budget!